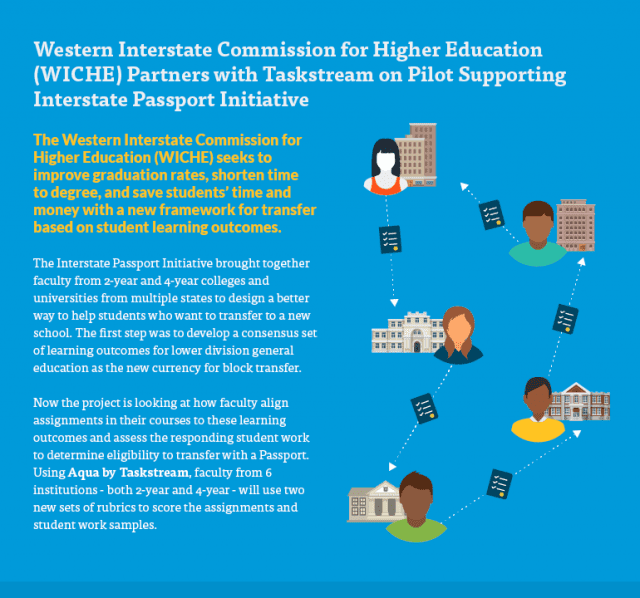 NEW YORK – May 11, 2016 — The Western Interstate Commission for Higher Education (WICHE) and Taskstream – the leading provider of assessment management and e-portfolio solutions for higher education – just announced the formation of a new partnership to pilot a mapping process in support of the Interstate Passport Initiative’s new framework for the block transfer of lower- division general education based on learning outcomes and proficiency criteria. ”By engaging faculty in a closer look at how and what types of assignments are being used to determine proficiency with the Passport Learning Outcomes within and across institutions, our goals are to share ideas in proficiency assessment among participating institutions and to expand faculty understanding and choices of assignments in courses they include in their institution’s Passport Block,” said Pat Shea, Director of Academic Leadership Initiatives at WICHE and Project Director for the Interstate Passport. The Western Interstate Commission for Higher Education (WICHE) is a regional organization created by the Western Regional Education Compact and adopted in the 1950s by Western states. WICHE and its 16 member states and territories work collaboratively to expand educational access and excellence for all citizens of the West. By promoting innovation, cooperation, resource sharing, and sound public policy, WICHE strengthens higher education’s contributions to the region’s social, economic, and civic life.